The wind chill factor is the method used by weather forecasters to tell us how much colder the wind makes unprotected skin feel. So why do meteorologists say it's -10 with a wind chill factor that will make it feel more like -18? Why don't they just say it's -18? The wind doesn't actually change the temperature outside, but the temperature we feel is not the air temperature but our skin temperature. A person will sense that it's colder because the wind steals body heat by blowing away warm air that surrounds the skin. This means the wind chill factor is not a factor for inanimate objects like rocks, cars and snow – they will all maintain the same temperatures no matter how strongly the winds blow. The new wind chill index adopted in 2001 uses a mathematical model developed at Environment Canada that approximates how skin temperature, especially on the face, changes with various air temperatures and wind conditions. The math was put to the test in the research labs of the Department of Defence in Toronto. A group of 12 volunteers, six men and six women, went through clinical trials in a refrigerated wind tunnel to see how the model held up in a real-world situation. The coldest wind chill recorded in Canada was at Pelly Bay, Nunavut, on January 13, 1975, when 56 km/h winds (a wind chill factor of 3,357 watts/m²) made the temperature of -51 C feel more like -92 C.
The average high temperature in Yellowknife in January is -23.9 C. The average low is -32.2. Temperatures in Ottawa are similar to those in Russia's capital. For the month of January, Ottawa's average high is -6.3 C and average low is -15.5 C, while Moscow's average high is -7 C and average low is -13 C. Average highs and lows for July, the warmest month, are also close for the two cities. The wood frog, which is commonly found across Canada, has what's called freeze tolerance. In winter, the wood frog hibernates on land, usually using only a pile of leaves for shelter. Because this leaves it exposed to the cold, frost penetrates its skin and freezes its internal organs, halts blood flow and stops respiration. The heart stops beating and muscles stop moving. The wood frog's body functions return to normal when it thaws. 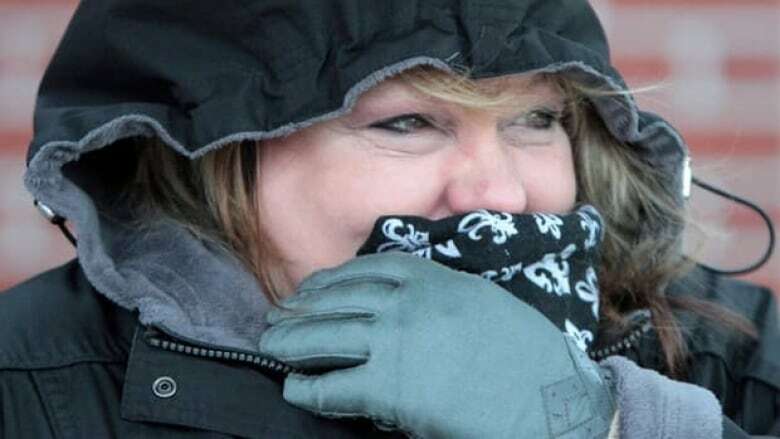 Environment Canada also warns of the level of risk of frostbite associated with a wind chill factor. For example, when the wind chill is from -28 to -39, exposed skin can freeze in 10 to 30 minutes. Before 2001, Environment Canada would calculate wind chill as how much energy (or heat) the body loses per second depending on how much skin is exposed to the wind. Wind chill was measured in watts per square metre, with values ranging from 1,000 to more than 3,000. But because a wind chill factor of 1,500 watts/m² is meaningless to most people, the value was translated to the temperature it would have to be to cause the same degree of heat loss without any wind. This is called the wind chill equivalent temperature – what you hear when meteorologists say, "Dress warm. It's -10 but with the wind chill factor it will feel more like -18." Different countries use different formulas to calculate the wind chill factor and the wind chill equivalent temperature. However, they are all based on research conducted by scientists Paul A. Siple and Charles F. Passel in the 1940s, later used by the U.S. army to develop warmer clothing for soldiers. The research found that the rate at which water freezes depends on three factors: how warm it was to begin with, the outside temperature and the wind speed. Canada and other countries adopted the wind chill index as a public health tool so people could protect themselves from cold-related ailments such as hypothermia and frostbite. This is especially useful for those who are going to be outside for long periods of time, whether snowmobiling or shovelling the driveway. Hypothermia results when body temperature falls below 35 C. Symptoms include drowsiness, impaired co-ordination and weakness. It can also be fatal. Frostbite is the result of skin freezing. It causes swelling, redness, tingling and burning. Skin turns white and waxy as the frostbite progresses. Infection and loss of extremities can result. Frostnip is a condition where ice crystals form under the skin. Chilblains occur when bare skin is exposed to cold water, or when wet skin cools. The skin itches and swells. Chilblains can lead to gangrene. According to Statistics Canada, 111 Canadians died from effects of the cold in 1997. Ninety-two of them were victims of hypothermia. Two cases of chilblains were fatal that year, and one person died from conditions resulting from frostbite of the hand.